The recent joke that Governor Mike Huckabee told regarding Barack Obama had a casualty after all . The end result was that Huckabee will not be the vice presidential nominee. Huckabee had recently been gaining traction during the vice presidential sweepstakes. Huckabee was influential with evangelicals and social conservatives during the Republican primaries. This election will be like the last two elections very contentious. If adding the element of race into the campaign , it can be very dangerous . Huckabee's joke in addition to stoking some latent fears of racism indicated that Huckabee cannot stay on message. The success of the Dems and the GOP for the fall , rests upon its candidates staying on message to win the election. Huckabee proved himself to be quite an entertainer during the primary season , perhaps he should have stuck to playing the guitar. Since the beginning of the republic , African -Americans have constantly created and developed their message.In these days of blogging ,24 hour news stations ,and podcasts , African Americans need a central point of communication . Bob Johnson of BET was one of the first pioneers of black news and entertainment . Johnson's format was however heavily reliant on pop Black Culture . Former Congressman Watts has now taken the news genre to a new level with the formation of a all black news station .The all news network will fill a void left by the cancellation of BET's Nightly News in 2005. The broadcast communication industry should welcome Watts foray into broadcasting as this will increase African-American viewership on the airwaves , that has up to now tuned into MSNBC , Fox ,and CNN . The channel will promote additional African American political contributors with a diversified political opinion, instead of the left leaning biases promoted by the competition. My hat goes off to JC , it is not often a Texan brags on a Sooner , but I will have to do it this time , "Boomer Sooner" . 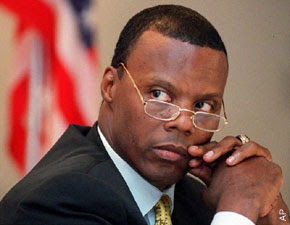 May 27, 2008 -- Former congressman J.C. Watts is behind a major push to launch an all-news channel for black people. Memorial Day for many is a day off work to BBQ . For others such as me it is a solemn day to thank all those Americans who have paid the ultimate sacrifice. My grand father served in World War II , and my father served during the Viet Nam Conflict . They both came back , with no war stories to enthrall my youth , but with quiet reflection of what had occurred during their service . Let us think of the soldiers who now serve in Afghanistan and Iraq. Some of these patriots will return back home as my father did chastened by war,and remembrances of those who did not return. For each soldier that returns ,he leaves a part of himself on the battlefield .For those who did not return ,today is for them .Because of their sacrifice of yesteryear ,we Americans have a tomorrow. The Barack Obama candidacy has caused American fears for a potential black president . While most citizens have accepted the candidacies of a female presidential candidate or a black president ,there will always be an element that hates the possibilty of an black president . The press plays a large part of the education of the electorate,and visuals often say a thousand words. 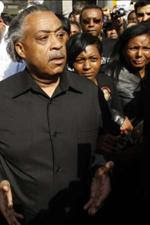 Recently the weekly Roswell Georgia newspaper published an article that portrayed racist anger toward Barack , and black voters concerns regarding Obama's safety . The article detailed the challenges that local Georgia police departments have in protecting Barack Obama when he visits their towns .If a picture says a thousand words ,what inspiration would a Georgia good ole boy get when he would see this picture ? The Roswell Beacon has a right to publish the article and the visuals ,and once again we have the right to be afraid . 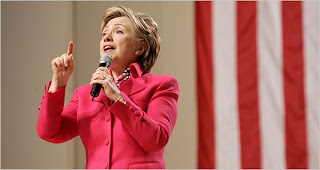 Hillary Clinton has a right to run and will continue campaigning until the nominatinion of the Democratic candidate .She will continue her race until the super delegates finally weigh in and crown the nominee . In all liklihood it will and should be Barack Obama . Many Dems say Hillary should exit the race . There is no way she can do that , for one she is bigger than herself , she has become a symbol. Hillary is a symbol of two things , first the Bill Clinton presidency , and second the feminist movement. Both of those movements will and can not permit a Hillary Clinton candidacy to end until the nomination is a done deal . For pure selfish economic reasons Hillary can not terminate her campaign . 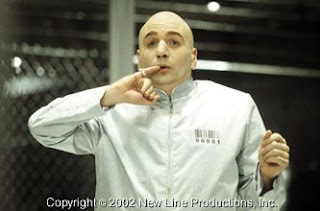 Hillary has loaned herself several million dollars . 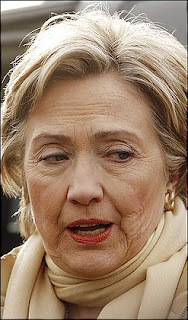 If Hillary ends her campaign then she will find it harder to raise funds to retire her campaign debt . At this point , Hillary probably needs your money more than your vote . Hillary will go down in history for her spirited presidential campaign , but as it is in all campaigns , Money is the mother milk of politics . This presidential campaign proved that Barack was the milkman. Meanwhile Hillary and Bill were left dancing for dollar$. Columnist Larry Kudlow recently wrote a piece that critcized the Democratic Party while praising the merits of Joe Lieberman. A portion of this interesting article reads as follows . Senator Joe Lieberman talked at some length about how the Democratic party has completely departed from the strong national-security principles of Franklin Roosevelt, Harry Truman, and John F. Kennedy. He said those leaders clearly understood the need to fight totalitarian dictators and regimes, and that they possessed the moral clarity that can separate friends from enemies in the long-run battle to promote freedom and democracy. He mentioned John Kennedy’s famous quote, “that we shall pay any price, bear any burden, meet any hardship, support any friend, oppose any foe, in order to assure the survival and the success of liberty.” He mentioned Ronald Reagan as an heir to that tradition . I agree the bitter truth is that the Democratic party has not had a strong national security presence since Viet Nam . When will the Dems wake up! If the Dems can get their nerve back and stop placating to the vocal left ,we can have a meaningful coherent national security policy that transcends party loyalty. My concern is as most Americans have is that we like the GOP in foreign affairs and like the Dems in home security .Americans vote on fear , and currently home security fears override national security fears . Gasoline is approaching $4.00 a gallon , the world can wait .The Dems can possibly win this election cycle but when its over they must deal with the bullies in the world . The Dems most find their national security mojo , and the sooner the better. Jon Nielsen from the Dallas Morning News (DMN 05/16/08 edition ) contributed content for this blog. When pigs fly ! They fly in Grand Prairie Texas . My home town recently built a 20 million dollar $tadium for a minor league baseball team , the name of the team Grand Prairie Air Hogs . The Airhogs name come from the nickname pilots game themselves when they use to hog the airspace . 6000 plus Grand Prairie residents crowded into a ballpark Friday night that was less than 10 miles from were the Texas Rangers are playing against the Houston Astros . The best is yet to come for this team and Grand Prairie . It seems like the whole town was cheering for the success of the team and the town. Grand Prairie resident Ed Gray is among those who bought season tickets for the AirHogs' inaugural season. He'll be at QuikTrip Park for the first pitch tonight. 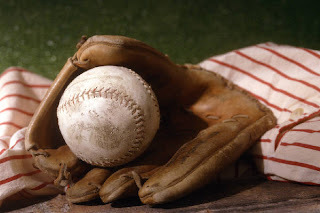 "I can't think of this weekend without my mom, apple pie and baseball," Mr. Gray said. A 17-year resident of Grand Prairie, Mr. Gray said he remembers the buzz when the Lone Star Park horse-racing track opened in 1997. He said he feels the same way about QuikTrip Park. "One of the things that I'm also excited [about] is the baseball they bring to the city is a family event," said Mr. Gray, who purchased three season tickets behind home plate. "You have a lot of crowd participation; the prices are reasonable. With the economy being the way it is now, you have to stretch the dollar." The baseball stadium joins Lone Star Park and Nokia Theatre in Grand Prairie's entertainment district off Belt Line Road. In addition to the AirHogs' sold-out home opener tonight, Nokia Theatre will host comedian George Lopez and Lone Star Park will have its nightly live horse races. processed wearing , sweat suited warrior to an suited and booted warrior for the causes of Black America . In closing check out what Rev. Al says about his image. "Working with James Brown taught me something that black America must also learn -- to stop seeking the approval of white people or people in general and build your own image. I learned early on that if I was going to be successful, I had to define for myself my own set of standards, and I had to create my own image. I had to be me, regardless of what anyone else felt or thought about me." The Obama campaign was quick to respond that its candidate had made inroads in the latest contests among white voters, with exit polls showing he did better than, say, in Pennsylvania last month, and called Mrs. Clinton’s remarks disappointing and untrue. Is Hillary Race Baiting ? Methinks so . In desperation Hillary and Bill are swinging for the fences . I personally think they need to be thrown out of the game . The Clintons have proven again that they are masterful polticians , when appealing for white votes they will throw black voters under the bus . Can you say Sister Souljah ?